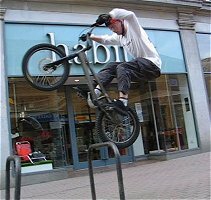 The pedal hop or pedal up is a nice controlled way of climbing on bars, wall edges and corners, where there is no room for the front wheel to rest. This is not a bunny hop. Rather than brute force, it offers much more control and it makes it easier to stay in balance on the obstacle. 1° Pedal slowly and use the bad foot (left pedal) to lift the front wheel towards the obstacle. 2° Accelerate with a kick in the good foot pedal (right-foot) while extending the legs like for an extension upward. 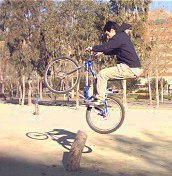 3° The impulse sends you off the ground, pull on the bars and fold up the knees to let the bike take off. 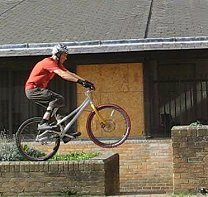 The same way the bunny hop could be seen as a backhop launched while riding along, climbing with a pedal up is like launching a pedal hop while rolling along. It is important to get your distance marks, so that you know when to start lifting the front wheel with the goofy pedal, following up with the good-foot pedal kick and extension. 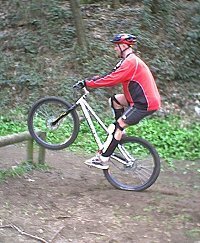 The big difference between the pedal up (sometimes also called touch hop) and wheel tap is that in the pedal up, you rely entirely on the pedaling and extension upwards. 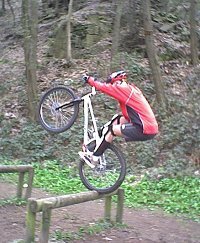 Even if you can sometimes touch the obstacle with the front wheel, it is only a visual bearing or accidental but not the main force. The pedal up is mainly like a rolling pedal hop with more extension upwards. 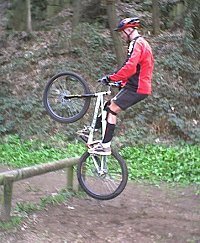 In the pedal up, you are already in extension when hovering the front wheel over the obstacle, whereas in the tap up, you are really accelerating into the edge or below and it is when you tap that you must jump into extension. Try this on small rounded edges. Rather than just a kick in the pedal, from a static position, you are already doing some smooth crank turns to move forward the obstacle when the pedal kick comes in (acceleration). With some practice, you can even launch a pedal hop without room for a complete crank turn. 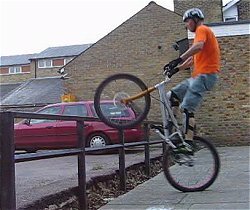 You need to have enough balance to prepare for the impulse without the bike moving. Then, an optimised pedal kick combined with an extension will let you climb on obstacles. 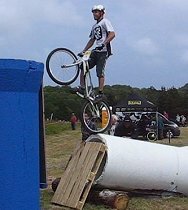 This pedal hop climbing technique is more realistic for use in biketrials competitions.